Here are some maps to help you navigate our beautiful area. There's so much to discover! Click on a map below for details. 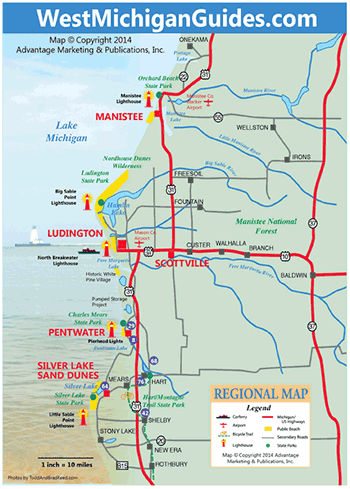 Located halfway up the West Michigan coastline, this map encompasses an area from Manistee, 30 miles north of Ludington--to Shelby, 30 miles south of Ludington--along the US-31 highway. Within this region are the villages of Hart, Pentwater, and Silver Lake. Driving on US-10 from the east, you'll go through Baldwin, Custer, and Scottville. Or arrive by water via the S.S. Badger car ferry, which sails May-October across Lake Michigan to Manitowoc, Wisconsin. Whether you travel by car or ship, the scenery is beautiful and the experience unforgettable! 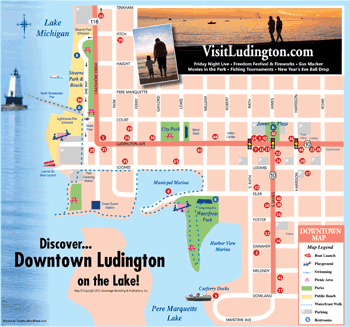 Only in downtown Ludington...can you shop, dine, and play while embraced by scenic views of Lake Michigan and the picturesque marinas and parks along the waterfront of Pere Marquette Lake. Browse our unique specialty stores, enjoy a meal, visit a local pub, or treat yourself to an ice cream cone. Then wander to the end of Ludington Avenue and out on the breakwall to the North Breakwater Lighthouse for a magnificent sunset. Be sure to wave at the S.S. Badger carferry as she sails out of the harbor! 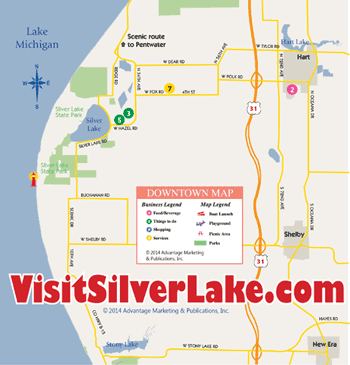 Come Stay and Play on one of the nicest lakes in West Michigan! 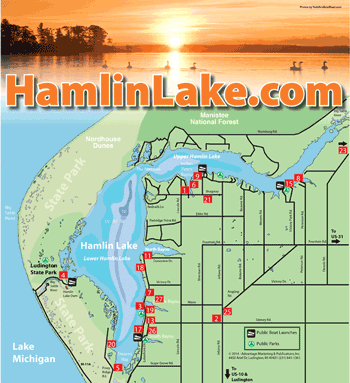 Just four miles north of Ludington, Hamlin Lake is more than 12 miles long and 5,000 acres large. About half the shoreline of Hamlin Lake is comprised of forest wilderness and scenic sand dunes; the rest consists of bayous, beaches, breakwalls and mini-parks interspersed with appealing, well-kept resorts and homes. The fishing on Hamlin Lake is great all year! The numerous trails that wind their way through the Ludington State Park are as varied as they are beautiful. The variety of trails gives visitors a choice--from a short 30 minute hike to a more leisurely 3 hour walk. Some trails are handicap accessible and others are great for an aerobic workout--the trail you select depends upon your fitness level and preferred pace. 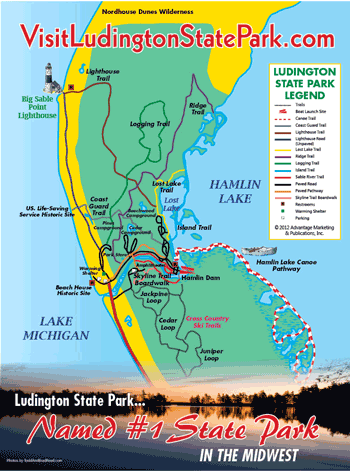 The Ludington State Park trails offer historical facts along the way and bring the natural beauty of the park in full view. The Eastern part of Mason County boasts small town friendliness, lush country scenery, the Manistee National Forest, and the Pere Marquette River. There's so much to discover along the Pere Marquette River! 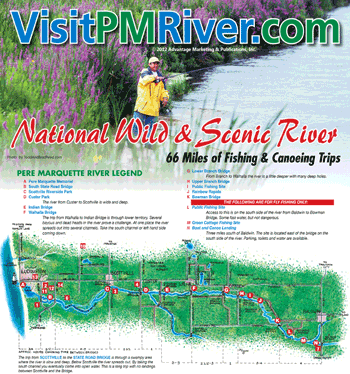 This map will detail river access, canoe liveries, campgrounds, and many retail stores and restaurants to make your trip along the Pere Marquette River a completely enjoyable experience. 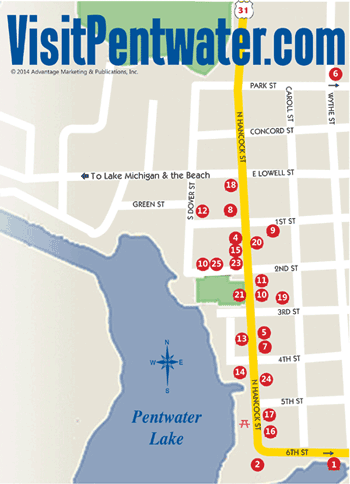 Just a few miles south of Ludington, the quaint village of Pentwater is situated on Lake Michigan and Pentwater Lake. This harbor community is a vacation-paradise, attracting visitors and seasonal residents alike. Pentwater is filled with historic village charm, beaches, boating, fishing, distinctive shopping, antiquing, art galleries, and a variety of dining and lodging facilities. While in Pentwater, be sure to visit the Village Green with ice-cream cone in hand and take a walk along the Charles Mears State Park beach. Scottville is the home of two "famous" attractions: the wild and zany Scottville Clown Band and the West Michigan Old Engine Club. The Scottville Riverside Park, on the Pere Marquette River, has 52 full service sites--and a swimming pool--perfect for tent and trailer camping. 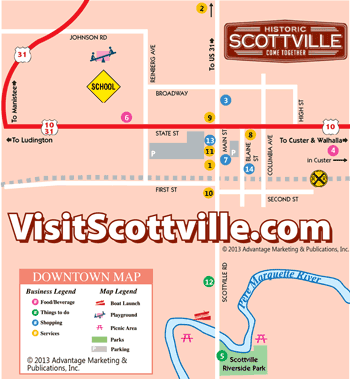 The Scottville Main Street business district is filled with charming stores and friendly merchants, who welcome you to relax and browse. The Silver Lake Sand Dunes is a favorite West Michigan destination, offering 2,000 acres of sand dunes to hike and enjoy. Explore the dunes aboard a dune scooter tour, or rent an off-the-road vehicle and head out on your own. Don't miss the century old Little Sable Point Lighthouse in a picturesque setting popular with artists, photographers and lighthouse enthusiasts. The city of Manistee is an exciting place to live and a wonderful place to visit. With its location along Lake Michigan, you can enjoy fantastic fishing, boating, and swimming. The Manistee-Huron National Forest, which stretches for miles, offers hiking, biking, and camping. A mile-long riverwalk runs throughout the historic business district along the edge of the Manistee River.